More tales of asking for evidence: is there any point to anti-bac pens? A pen you can lend without fear of passing on bugs? First of all, in case you’ve never heard of an ‘anti-bac’ pen, allow me to enlighten you. These are pens made of a special plastic that has been treated to be antibacterial. That pen you lent your mate only to suspect they might have been sticking it in their mouth, and possibly even more disturbing bodily orifices? Fear no more, if it’s an anti-bac pen no germs will adhere to its plastic barrel, and you can continue to chew it yourself with impunity. The anti-bac website also mentions BS EN 20645, and after a bit of studious googling (I believe I’m correctly following official guidance in using that verb) I discovered this standard relates to the antibacterial activity of textiles, specifically “woven, knitted and other flat textiles”. At the risk of stating the obvious, these pens aren’t knitted. Although apparently the standard can be applied to other materials, providing it’s “adapted accordingly”. So, how was the test adapted? Are the results published somewhere? Does it really last for the ‘entire lifetime’ the pen (and what is that?) Exactly how much bacterial and viral genocide actually occurs on contact with this shiny white plastic? I emailed the company to ask them about these questions. What did they say? Nothing, nil, nada. No answer. I even used the ‘sales’ address, as companies often actually check that one. Huh. Well obviously this would be a very short piece if I’d stopped there. So I went in search of another expert, and quickly managed to dig up the contact details of Professor Ian Jones at the University of Reading. A molecule of triclosan; bacteria beware! Unlike Anti-bac Ltd he was very quick to reply to my emails, and told me that these pens work in a similar way to anti-bacterial chopping boards. They incorporate a disinfectant into the plastic, usually triclosan. Triclosan is an antibacterial and antifungal agent. It’s actually quite a small molecule, falling into a group called polychloro phenoxy phenol. Sounds good doesn’t it? For the non-chemists out there, things with benzene rings (those hexagon thingies) and phenols (hexagon thingies with OH attached) are often not especially good for one’s health. And so we find the fire diamond for triclosan… now if you’re a regular reader you’ll be an expert with these by now. If not, just a quick reminder, the higher the number the nastier it is. That 2 in the blue section means that continued exposure could cause possible residual injury. Other substances with a 2 include the old-fashioned anaesthetic ether, and anti-freeze ingredient ethylene glycol. Of course, this is referring to significant quantities of the free chemical, not minute amounts embedded in plastic. And the Environmental Protection Agency concluded that exposure to triclosan – which turns up in lots of things, including anti-bacterial soaps – doesn’t present significant risks to human health. It might not even be triclosan in the anti-bac pens (the company didn’t get back to me, so we don’t know). Still… it raises an interesting point, given how paranoid many people are about chemical exposure. Which is riskier? Bacterial exposure or chemical exposure? Especially taking into account the findings from the University of Michigan School of Public Health that washing with plain soap is actually more effective than using those with antibacterial agents such as triclosan. I asked him more about the ‘lifetime of the pen’ issue, and he explained that the disinfectant is built into the plastic, so organisms are indeed killed when they come into contact with it. As the grip wears down fresh plastic is revealed, so theoretically the anti-bacterial properties never wear out. The problem is that that, of course, pens are picked up by sticky, greasy, sweaty fingers all the time and stuffed into icky pockets and less-than-pristine pencil cases. Once the plastic gets covered in a layer of grime, the whole thing will stop working. So in summary, chances are the active ingredient won’t really be effective for the lifetime of the pen under normal handling conditions. It might be true that active ingredient kills 99.9% of bacteria, but that could still leave quite a lot on the pen. Worth spending your money on? Maybe in places such as hospital wards, where the people handling them already (we hope) have scrupulously clean hands, but in your child’s grubby pencil case? Probably not. Want more? The third part of my Ask For Evidence work was recently published on the Sense About Science website, you can read it here. Tales of asking for evidence: are chia seeds all they’re cracked up to be? Are chia seeds all they’re cracked up to be? I picked up on a few different claims, the first of which had to do with chia seeds. They are the latest health food craze (well, you know, one of latest – this is an area that moves fast, another health food craze could have gone from magical weight-loss aid to dangerous cancer risk in the time it’s taken me to type this), and come with all manner of interesting claims from stabilising blood sugar levels to having “8 times more Omega 3 than salmon“. The trail led back to AZChia, a company set up by Dr Wayne Coates of the University of Arizona. Although, in Dr Coates defence, many of the more hyperbolic media claims don’t appear to have actually started with him, and his work seems to be rigorous. There are lots of claims out there in the press, but they most seem to boil down to omega-3 fatty acids. Now, there’s a whole other essay to be written on that topic, but essentially (wait for it) these are essential (boom) fatty acids. That means we need them to maintain good health and although there’s some controversy over exactly what they do and don’t affect, there’s no question they’re vital for a healthy metabolism. However they can’t be made in the body (not from scratch, anyway) so we have to eat them. 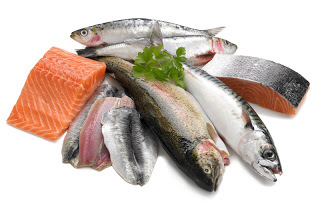 This is potentially tricky for vegetarians because the main source of omega-3 fatty acids is fish oils. But they do turn up in certain plant foodstuffs, and one such foodstuff is chia seeds. In fact, chia seeds biggest claim is that they are the “richest natural plant source of omega-3 fatty acids“. But before we go any further with this it’s important to realise that there’s more than one type of omega-3 fatty acid. There is a group of molecules that fall into this category, and some of them are tricker to obtain from certain food sources than others. In particular, there’s something called ALA (α-Linolenic acid), another called EPA (eicosapentaenoic acid) and finally DHA (docosahexaenoic acid – these names just get better and better don’t they?). The main source of these last two, DHA and EPA, is cold-water oceanic fish, like cod and salmon. Both EPA and DHA are converted into prostaglandins which regulate cell activity. DHA is a structural component of such minor essentials as your brain, retina and skin. Make no mistake, you need these molecules. ALA is slightly different. ALA is available from plants such as, guess what, chia. And also kiwifruit seeds (bizarrely, these have nearly as much as chia seeds), perilla and flax, otherwise known as linseed. Humans cannot make ALA; we have to eat it. However our bodies can make DHA and EPA from ALA. So, eat your ALA-packed plants and, in theory, you get the complete set. But it’s not quite that simple (it never is, is it?) Yes we can synthesise DHA and EPA from ALA, but only poorly. For adults, it might be less than 1% for DHA, and probably less than 5% for EPA (the numbers are slightly higher, although not much, for babies). Back to that claim that chia seeds have 8 times more omega-3 than salmon (not, I should stress, a claim actually made by Dr Coates). It is true? Well, 100 g of salmon contains roughly 0.4 g of ALA, whereas 100 g of chia seeds contains more like 18 g. So that’s actually a lot more than 8 times. On the other hand, chia seeds contain no DHA or EPA (fish sources, remember) whereas salmon will give you about 1.4 g and 0.4 g respectively. Chia seeds may contain more omega-3 in total than salmon, but it’s not the good stuff. There’s none of the DHA that’s so important for healthy brain, skin and eyes. You might be able to convert a little bit from the ALA that is there, probably enough to get by (particularly if you’re a vegetarian or a vegan and willing to eat a lot of seeds), but oily fish really is the best source. So tricky to prove, but probably true. Possibly. There is a little more to this story. Chia seeds are often promoted as a whole food, packed full of many nutrients over and above omega-3s. A ‘super-food‘, if you will. They do indeed contain a whole range of nutrients. But Dr Loren Cordain, author of the book The Paleo Diet, contends that chia seeds also contain high levels of phytate. Phytate is the salt of phytic acid, and is a substance that binds minerals such as calcium, iron, zinc, magnesium and copper, making them unavailable for absorption by the body. As a result, chia seeds are actually quite a poor source of these minerals. And, as with all plants, it’s a similar situation with vitamin B6 – it’s something we absorb far more effectively from animal sources. In short, just because something’s in a plant, doesn’t mean we can make use of it. If you’re not a vegetarian, stick to your oily fish. So, in summary, should you be sprinkling chia on your breakfast cereal? Well, it probably won’t do any harm. If you’re a strict vegetarian or vegan they may be worth considering, although they’re probably not worth paying a lot of money for. If you’re a meat eater, you’re almost certainly better off sticking with oily fish – it’s a much better source of the really essential fatty acids. I also investigated some other claims for Ask for Evidence, one of which was the statement made by Health Journalist Hazel Courteney on national radio that “the average person absorbs into their bloodstream alone about 14 kg of toxins annually through their skin.” There is more to follow on this particular story, and it should appear on the Ask for Evidence page shortly. There was also something on anti-bac pens which I’ll discuss next time. Watch this space! Oooh my blood fairly boiled yesterday, it really did. Well ok, not really. At least not in the sense that my blood reached 100 degrees Celsius, more in the sense that I was shouting pointlessly at the radio. Why? Because the Jeremy Vine radio show on BBC Radio 2 had a piece about the Royal College of Obstetricians and Gynaecologists’ (RCOG) paper that suggested that pregnant women should avoid exposure to certain everyday chemicals. Now, I will get to that issue in a minute, but first let’s talk about the item on the radio programme. It started with lots of talk of avoiding ‘chemicals’, and Jeremy asking if listeners made a habit of avoiding them. Now as I discussed in a previous post, chemicals are all around us. Because everything is a chemical. Water is a chemical, so is oxygen, so is baking soda, so is vitamin C. Frankly, anyone who thinks they avoid chemicals doesn’t understand what they are. Now, this was BBC Radio 2. If someone had mixed up the words less and fewer there would be hell to pay, but apparently no such rigour applies to use of scientific terms. The next irritation was the choice of guests. Hazel Courteney was pitched against Adam Hart-Davis. Courteney is a journalist specialising in alternative health (alternative treatments being, by definition, the ones which have not been proven effective using scientific methods; the ones which have been proven effective are, you know, medicine). She was described on the show as a ‘health journalist’ but as far as I can tell, she has no scientific or medical qualifications. Hart-Davis, on the other hand, has a PhD in organometallic chemistry. Is this balanced? Just because two people appear to have opposing viewpoints, should they necessarily be given equal weight? It happens all too often with scientific and medical issues, presumably because it’s perceived as being more entertaining, but it’s worrisome because it gives the impression to the listener that the two people are equally qualified and knowledgeable. So were they? Let’s get on to some of the things Courteney said. I have forced myself to listen again on iPlayer to make absolutely sure I’m not misquoting. I hope everyone appreciates the sacrifice. My blood pressure may never be the same again. I can find no evidence for this claim, and have no idea where it comes from (update: I later went on to write a blog post for the Ask for Evidence campaign on this question). Skin is actually pretty impermeable stuff. If it weren’t we’d all be in a whole heap of trouble every time we had a bath. Never mind chemicals, you’d turn into a water-filled balloon. There are some chemicals that can be absorbed through skin, but not many in the grand scheme of things. Nicotine is one, that’s how nicotine patches work, but that’s fairly easily avoided. There are herbicides and pesticides that can be absorbed this way, but unless you’re spraying with them and utterly failing to follow health and safety protocols (there’s a reason people wear gloves and masks), you’re not going to come into contact with anything at all significant. Even if you’re spraying without the proper safety gear, you’re not going to absorb 14 kg unless you take a bath in the stuff. Stop press: pregnant women shouldn’t bathe in herbicide. One of her less outlandish claims, but I include it because first of all, not really. Most bleaches sold in this country are based on hypochlorite, not ammonia. And the majority of window cleaners on sale are little more than some detergent and vinegar. Ammonia might once have been in hair dye, but a lot of them are marketed as ‘no ammonia’ these days, mainly because consumers hate the smell. Ammonia really stinks. Secondly, it’s pretty irrelevant. Yes ammonia is toxic, but it’s also extremely volatile. In a well-ventilated area it will quickly disperse and you’ll barely notice it. The small quantities you might inhale aren’t harmful because the body actually has a mechanism to prevent ammonia build up (because it’s a by-product of breaking down protein, which we all do whether we know it or not). Yes if you lock yourself in an enclosed space with a large quantity of ammonia gas, it will irritate your eyes and lungs. But, you know, don’t do that. Oestrogen is a builder? What, like Bob? I’m not even sure what she means by that. Oestrogens promote the development of female secondary sexual characteristics, such as breasts, and there are legitimate concerns about certain substances in the environment causing fertility problems particularly for men, who under normal circumstances wouldn’t be exposed to oestrogen. But a major contributing factor to breast cancer? Well, according to the NHS choices website, the major contributing factors are age and family history. Way down the list is: “Your risk of developing breast cancer may rise slightly with the amount of oestrogen your body is exposed to.” Note the word ‘slightly’. Not ‘significantly’. And using combined contraceptives, hormone replacement therapy or just being a woman will expose you to a lot more oestrogen than you’ll ever seen from your environment. In fact, being pregnant actually reduces your exposure to this hormone, because its production is disrupted during pregnancy. So in this respect by being pregnant you’re doing yourself a big health favour. That’s something comforting to remember when you’re throwing up and nursing your swollen ankles. PCB stands for polychlorinated biphenyl. They were once used as plasticisers, but mostly in paints and cements. They’re definitely toxic and they’ve been linked to cancer. But PCB production was banned by the United States Congress in 1979 and by the Stockholm Convention on Persistent Organic Pollutants in 2001. If you have clingfilm that contains PCBs, I’m curious to know where you bought it. Now, there is ongoing debate about a substance used in plastics called bisphenol A (BPA). It does exhibit hormone-like properties, it might be released when certain plastics are heated, and the European Union, Canada, and the United States have consequently banned BPA use in baby bottles. Baby bottles are a specific case though; you have to bear in mind that a lot of people sterilise them by heating to high temperatures for extended periods of time. The Food Standard Agency’s position is that “current level of consumer exposure to BPA from food contact materials does not represent a food safety risk for consumers”, that the science shows that it only has “weak oestrogenic effects” and that “effects [are] generally seen at high doses”. Genuine concern aside, I still take issue with Courteney’s use of the words “large amounts”. The Plastic Materials and Articles in Contact with Food (England) Regulations 2009 (snappy title) permit the use of BPA provided that no more than 6 mg per kg migrates into food. Let’s say we have a plastic container that weighs 100 g (that would be quite a large tub), that means that at the very top end we’re talking about 0.0006 g of BPA getting into your food. And it’s highly likely to be far less than that in reality. That’s not a ‘large amount’. Still I will grudgingly admit that she may have a bit of a point here: if all this worries you, put your food into a glass container before you heat it. Mmm. So, better not eat your shampoo or shower gel then. Why is she talking about ‘ingesting’ substances which aren’t generally eaten? Sodium lauryl sulfate and sodium laureth sulfate are detergents, that bit’s true, but they’ve been used for an awfully long time and there really is no evidence either is horribly harmful. Both have been tested extremely rigorously, and have been consistently shown have no causal link with cancer. It’s just possible they might cause skin irritation in sensitive individuals, that’s about it. Although you know, perhaps it is better to be safe than sorry. Wouldn’t want to risk an angry liver. Er, what? Just, what? This makes no sense. She’s saying that it’s safer to eat these substances than put them on your skin? But didn’t she just say that sodium laurel sulfate was particularly harmful if ingested? Make your mind up. All this nonsense in 18 minutes. Impressive, no? Poor Adam Hart-Davis did try and argue against some of it, but I fear he lost the battle. I’m not sure he was expecting quite such an onslaught. Poor man. I should make brief mention of the thing that started all this in the first place. The Royal College of Obstetricians and Gynaecologists (RCOG) released a Scientific Impact Paper titled “Chemical Exposure During Pregnancy: Dealing with Potential, but Unproven, Risks to Child Health” (I have linked to the actual, original, paper, not a news report). Now, the clue is in the title. Unproven risks. Essentially they are commenting on the, very small, possibility that a pregnant woman’s exposure to a variety of environmental toxins might combine to create a harmful effect to the baby. They suggest using fresh food rather than processed (shock), as well as some less practical tactics such as reducing the use of foods/beverages in cans/plastic containers (perhaps women should carry their water supplies in a traditional oilskin bag?) and minimising the use of personal care products such as moisturisers and shower gels (presumably it would be much healthier to just stop washing). In fairness, the original document does include statements that balance things a bit. It comments that: “Under normal lifestyle and dietary conditions, the level of exposure of most women to individual environmental chemicals will probably pose minimal risk to the developing fetus/baby.” And, “it is unlikely that any of these exposures are truly harmful for most babies”. Unfortunately the media didn’t initially present that side of it. We had multiple headlines such as: “Pregnant women warned over household product chemicals” and at the more alarmist end of the spectrum: “Pregnant women told to avoid painting the nursery, buying new furniture or going near non-stick FRYING PANS” (sic). Fortunately lots of other, more sensible, people immediately started writing about the issue and now a search for this particular news item brings up lots of articles putting the other side, for example: “New advice to pregnant women is unhelpful and confusing, say critics“. I don’t think there’s any need for me to say it all again. But if you are pregnant right now, my advice (as someone who’s recently been through it) would be to try not to worry about it, put your feet up and have a biscuit. Pregnancy is difficult enough as it is.